I bet many will agree the street food is one of the essence experience for travellers in Korea. Many would probably have experienced the bedazzling moment when you’re on the streets of Myeongdong, Dongdaemun or Hongdae– the choices are endless, and you don’t want to miss any of them. Street food is ubiquitous, a daily something, and it is nationwide — you get it everywhere in Korea. But the ingredients and style slightly differs from each province. 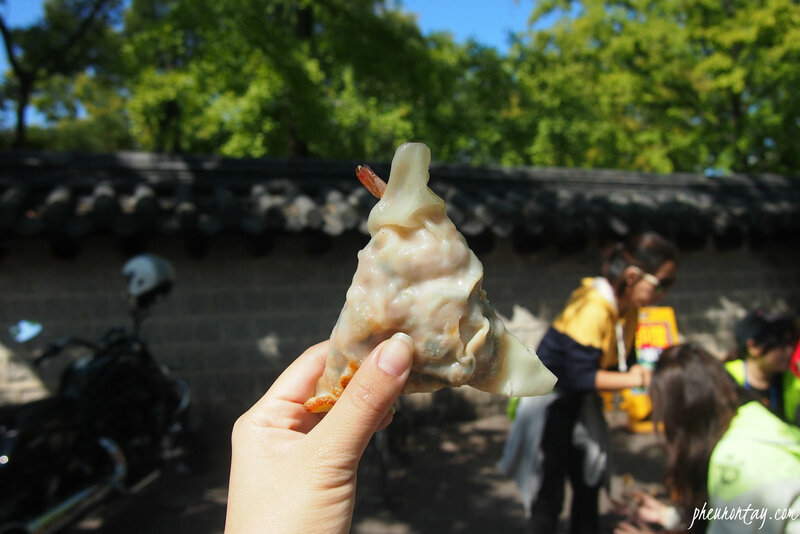 Jeonju was chosen as “Creative City of Gastronomy” in 2012, under UNESCO’s creative city network project. I believe it has to do with the city’s traditional way of cooking handed down from generations to generations that span thousands of years. 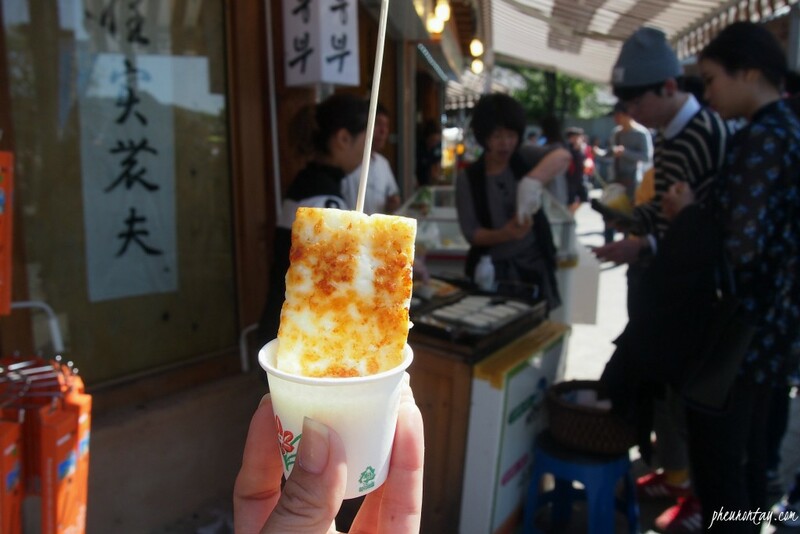 If you ask me what is there do to in Jeonju, I’d recommend you to slot in a street food hunt on your activities list. Cos it is yum and fun! This elegant and delicate dessert 딸기 찹쌀떡 is what you should really check out. 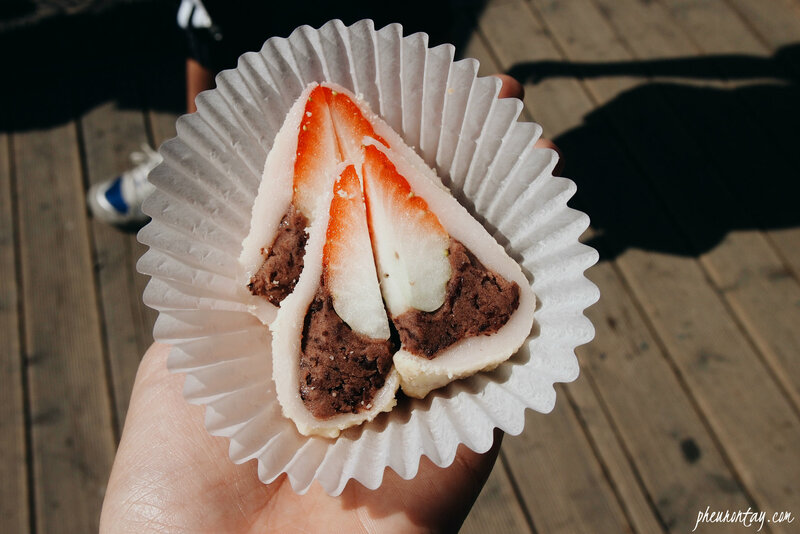 Whole, fresh strawberry and slightly sweetened red bean paste wrapped in a thin layer of soft mochi. The sweetness of the red bean is not too overpowering, a match made in heaven with the fruity notes coming from the strawberry. 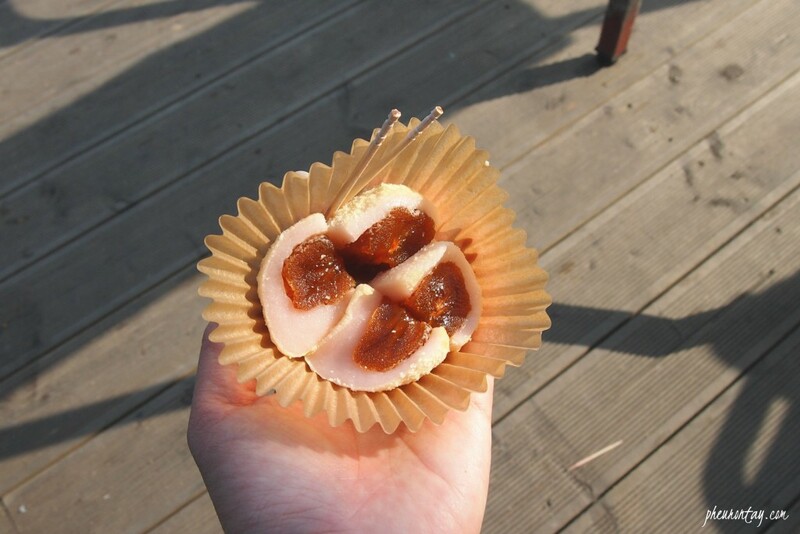 Winter is the best season for dry persimmon and the store came out with this Dry Persimmon Mochi 곶감 찹쌀떡. Priced the same as its strawberry counterpart, this seasonal mochi is worth trying. Korean dry persimmon is meaty and a lot juicier than the usual dry persimmon imported from China. If you like dry persimmon, you’ll definitely like it. Pungnamdong 3(sam)-ga, Wansan-gu, Jeonju-si, Jeollabuk-do, South Korea. 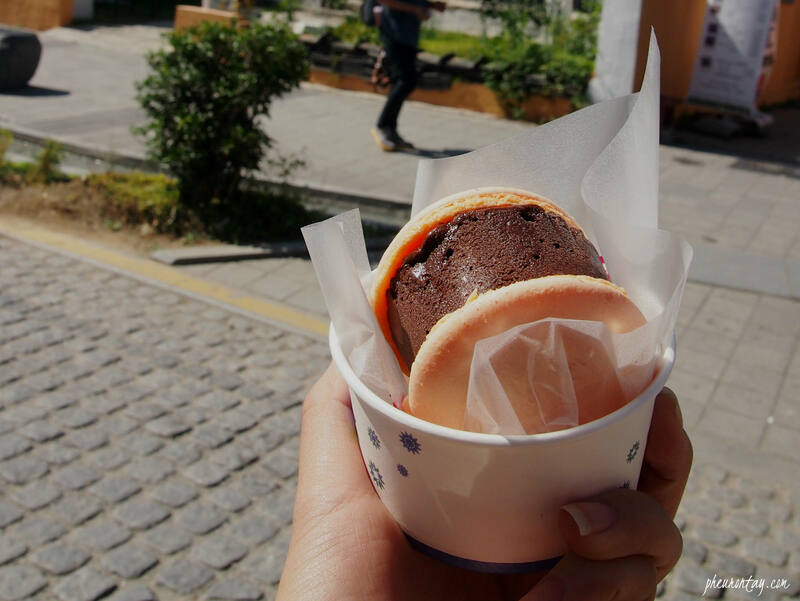 Well, I am sure you might have tasted macaroon ice cream in Seoul, but I just felt like having one in Jeonju so here it is. Locals here love it as well! 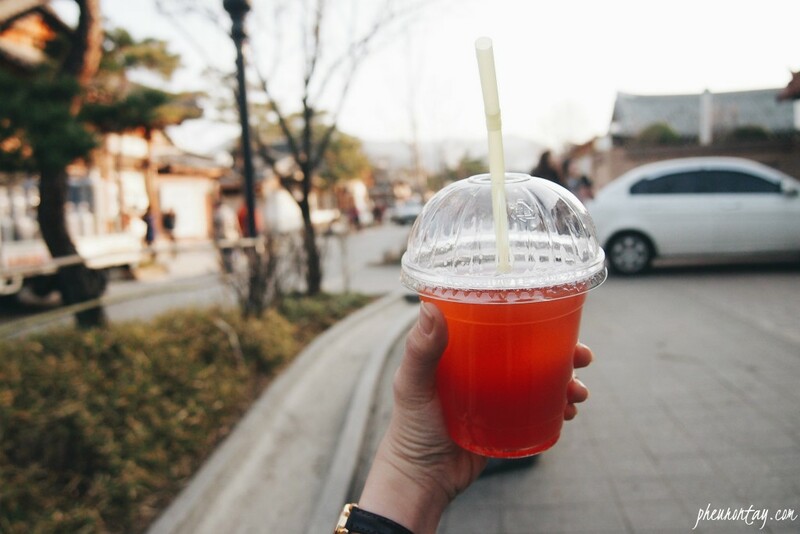 I received some of the queries while I was doing my real-time update on Instagram, asking if it really taste great as some of you were quite disappointed with those on the streets of Seoul. I have to say mine was actually quite yummy. This one I had was dark chocolate ice cream with orange macaroon, a pretty popular combination for dessert. It turns out delicious. I am not quite an adventurous person when it comes to dessert. My take is to only choose less adventurous ones to avoid disappointment if you are unsure about the flavours. 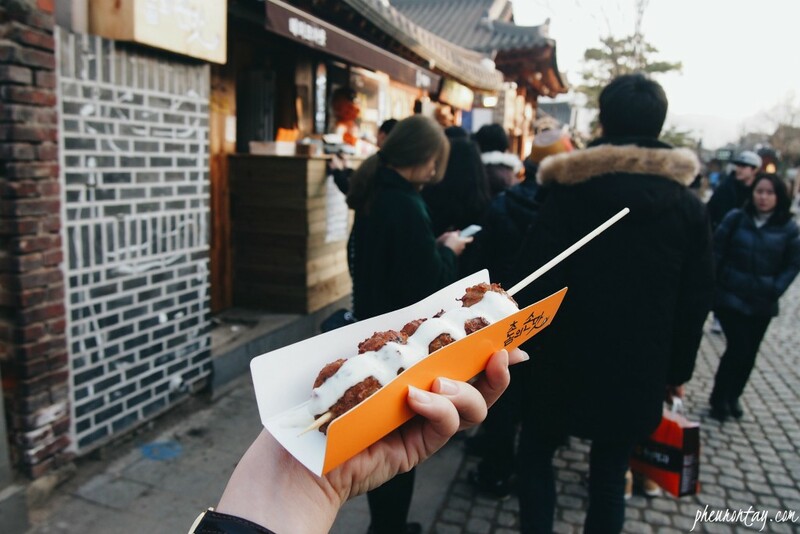 I have to say this meatball skewer 완자꼬치 from “Chon-nom-eui Sonmat” is my best find in Jeonju Hanok Village. None on the list had made me crave for it so much as it does. It is well marinated, huge and juicy. Oh! and the sour cream made it even better! 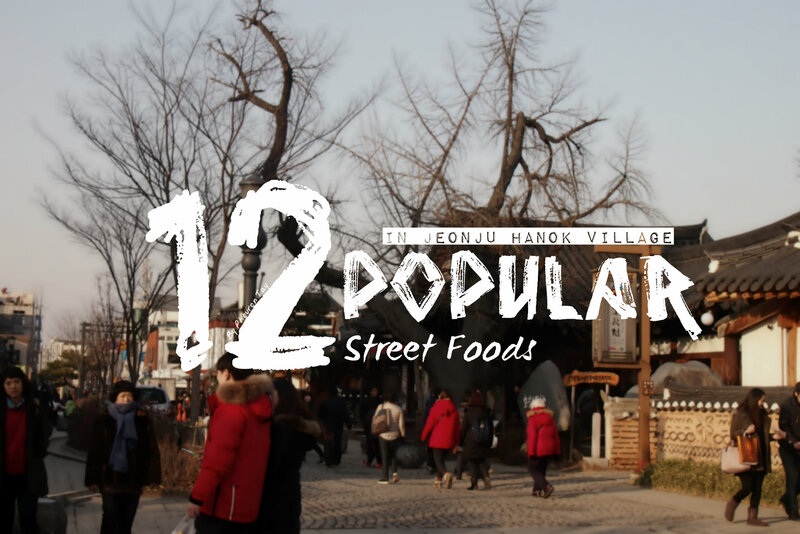 One of the best street foods in Jeonju. Address: 완자꼬치. 촌놈의 손맛. 전북 전주시 완산구 중화산동2가 592-9번지. Junghwasan-dong 2(yi) ga, Wansan-gu, Jeonju-si. Jeollabuk-do. 592-9. 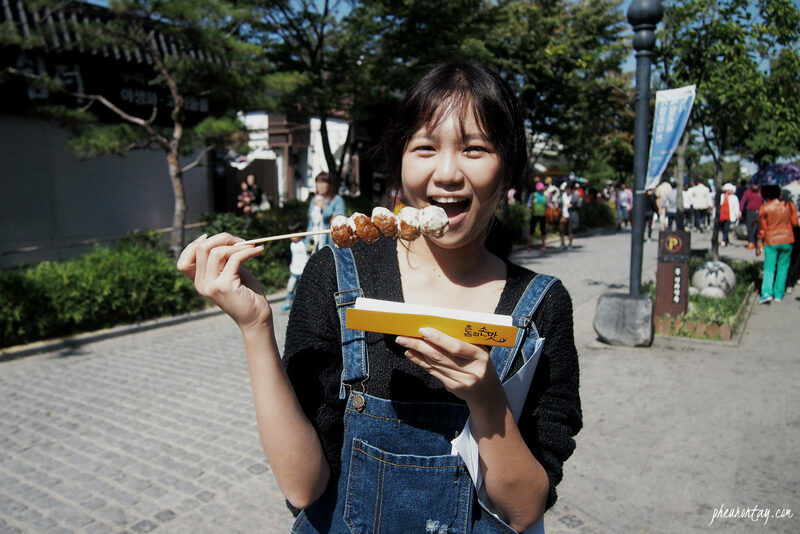 Flavoured beer from the meatball skewer store, 촌놈의 손맛. Although it was just grapefruit cordial in local beer, it is a refreshing drink, perfect to wash down the greasiness from the street foods you consumed earlier. Am I the only one who enjoy sunshine with beer? I hope not because sunshine and beer is just marvellous! 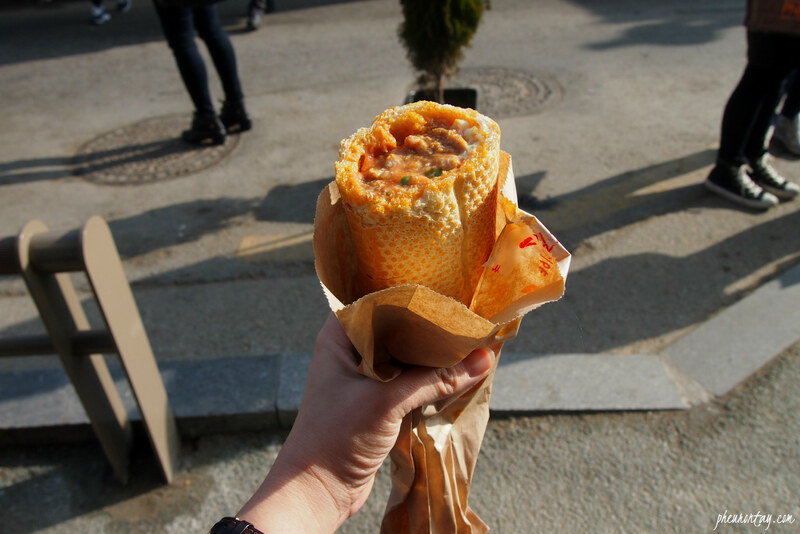 Another street food worth trying at Jeonju Hanok Village would be this grilled cheese skewer. The cheese is made of skim milk. It is grilled to golden brown with a slight crisp, then served with yoghurt dip. Very interesting pairing, and delicious nonetheless. Address: 임실 치즈꼬치. 전주시 완산구 교동 121. Im-sil Cheese Skewer. 121 Kyo-dong, Wansan-gu, Jeonju-si. Jeollabukdo. 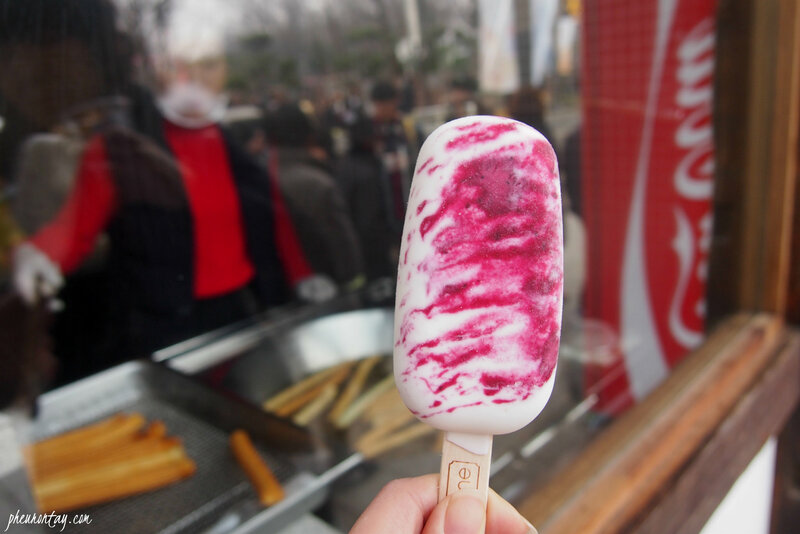 Handmade ice-cream from 츄즈미 (Chuzme). It is actually a churros and ice-cream shop. Their ice-cream comes in a wide variety of flavours, and they are all made of natural ingredients. I saw mango, strawberry, green grapes, kiwi, orange, green tea, black sesame, bokbunja (Korean raspberry wine) and various fruity yoghurt flavours. I got myself a blueberry yoghurt ice-cream. It was smooth, creamy and luscious, with plenty of blueberry bits –I would have gotten myself another one if it wasn’t winter. Address: 츄즈미. 전주시 완산구 교동 71-4. 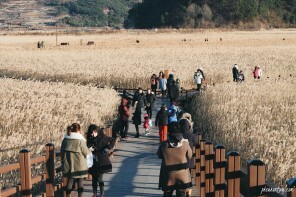 71-4, Gyo-dong, Wansan-gu, Jeonju-si, Jeollabukdo. 다우랑 (Dawoo-Rang) is a very, very, very popular shop that sells various kinds of dumplings. The crazy queue starts at 9.30am, and it took me 45 minutes during lunch hour to get my dumplings. The one I am holding in the picture is their signature item: 새우만두 Shrimp dumpling. To be very honest, I did not find it special and it puzzles me why people would queue that long for it because I simply could not tell the difference from Dawoo-rang’s to an ordinary dumplings shop. Well, this is my personal opinion. 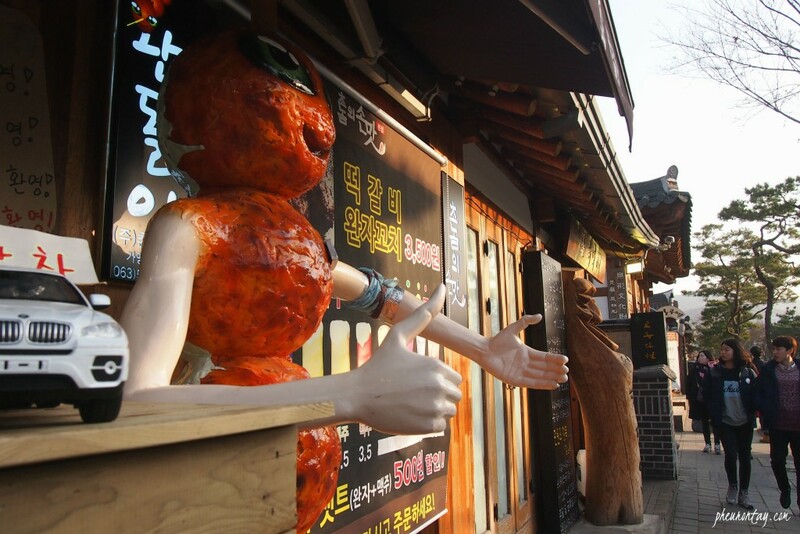 The fact is that they are really, really popular at the Hanok Village. Dawoo-Rang, Gyodong 269-2, Wansan-gu, Jeonju-si, Jeollabukdo. Chocopie is a very old-school snack in South Korea. Many of the ajussis, ajumma and even younger generations grow up eating them. 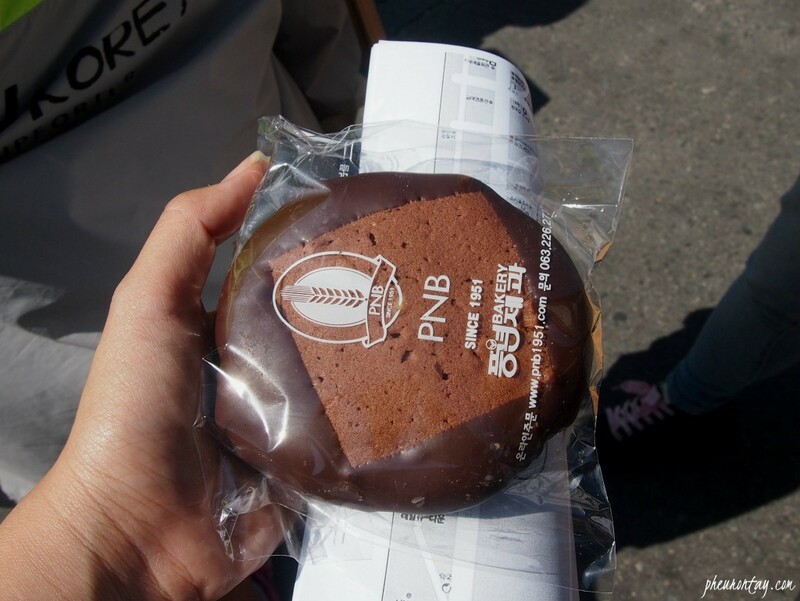 PNB Confectionary (풍년제과) is the company that produce Chocopies and many other old-school snacks since 1951. This mouth-drying chocolate cake has different versions depending on the company that produce them. Different from the usual chocopies that use marshmallows as fillings, PNB ones are filled with fresh cream and strawberry jam. Their queue is by far the longest among all popular spots. Address: PNB풍년제과. 전주시 완산구 은행로 61. PNB Confectionary. Eunheng-no 61, Wansan-gu, Jeonju-si, Jeollabukdo. Location: 교동 왕 닭꼬치. Gyo-dong Wang Dak-kkochi. Somewhere opposite PNB. A baguette “burger” that is super popular on social media. It is basically a hollow-out baguette bread filled with some tomato puree, cheese, some frozen peas and carrot. A highly raved street food on Instagram (check #길거리아바게트) but I find it quite strange for my taste. 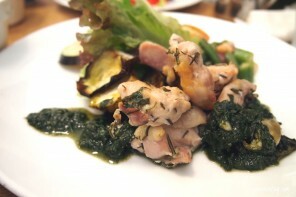 Firstly the sauce is too watery, and the bread was serve lukewarm. The mozzarella cheese was not even melted. Isn’t it supposed to be consumed warm? Not a fan, but I’d say go ahead and give it a try and let me know about it. Gilgoria Baguette Burger. Gyeonggijeon-gil 124, Wansan-gu, Jeonju-si, Jeollabukdo. A rainbow colour slurshie just reminded me of my highschool days, the 7-11 convenient store nearby the school, and their green or blue coloured Slurpee. Cheers to the good old days! Dalkomhan-guseok, Eunheng-ro 74-15, Wansan-gu, Jeonju-si. I was diagnosed with shellfish allergy a year ago and quit eating seafood since then. However, this stall was so popular that I decided to include it in the post. The queue was still long at 830pm. Online comment was positive as well. Some Naver bloggers even commented that this is the best street food among all. I am quite interested in knowing how does it taste. Please leave me a comment if you have tried it before. Address: 문꼬치. 전주시 완산구 교동 121. Octopus Skewer. 121 Kyo-dong, Wansan-gu, Jeonju-si. Jeollabukdo. 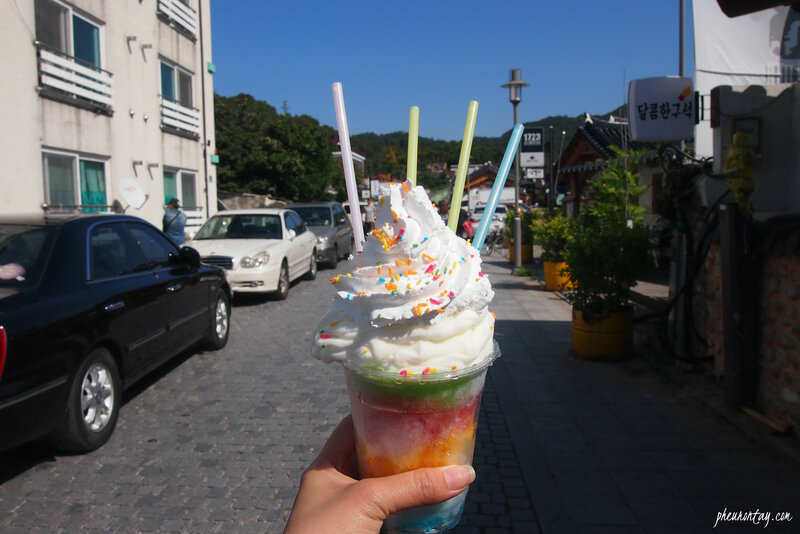 솜사탕빙수 Dreamy candy floss, colourful macaroons and shaved ice – This is certainly one very visually captivating dessert in Jeonju Hanok Village. You can find it at the same cafe where you get the Rainbow Slurshie. I have yet to try it out myself. But this certainly looks appealing. Similar to any other cafes in Jeonju Hanok Village, the size of the cafe is a little too cosy. You need a bit of luck to be able to get a seat in the cafe so when the chance came, do not forgo!